Welcome to "Photographing The World 4" Behind the Scenes episode 2. 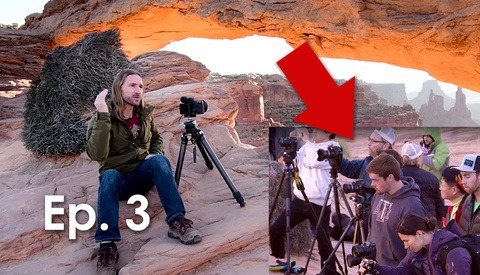 In this episode, we visit one of the most crowded photography locations in the world, Antelope Canyon. Even if you've never heard of Antelope Canyon, you've probably seen identical shots posted on Instagram for years: the sand pouring down a shelf on the wall, a sunbeam perfectly illuminating the dust in the canyon. Peter Lik actually sold the most expensive photograph in history in a canyon just like this for $6.5 million dollars (allegedly). The truth about these locations can be pretty shocking. Although they appear to be remote, they are owned and operated by an individual family. To get access, you must stand in line and buy tickets, and if you want to take the cliche shots without anyone in the frame, you'll have to pay extra for the "photography tour." The photography tour takes place with hundreds of other tourists jammed into this extremely tight canyon. When it's time for a photograph, our guide would push the non-photo tour ticket holders back so that we would have 60 seconds to all take the same shot. The guide threw sand at the wall to get it to create a waterfall effect for the first shot. I'm not sure what I expected, but I guess it doesn't make sense that sand would be flowing like water without human intervention. It still felt pretty lame. When it came time for the sun to create a beam in the canyon, our guide had everything perfectly planned to the second. He once again pushed back around 100 tourists, and we all tried to set up our tripods without blocking each other. The guide then started throwing dirt in our direction to create a cloud that could be lit by the sunbeam. Once again, we had about 60 seconds to grab the shot before the sun moved and the crowds were allowed to jump in front of us again. This experience was crazy, but I have to admit that the photos did look good. The canyon was incredible, but the magic was quickly lost with the crowds. 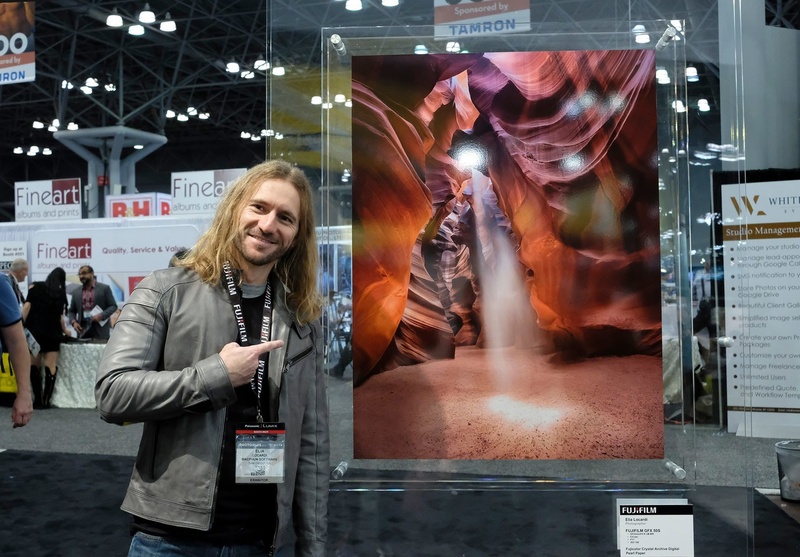 Elia ended up submitting his photo of the sunbeam and many others he had taken around the world to FujiFilm, and they actually chose to print the canyon shot over the others. I'm very torn in this situation. One part of me wants to say nothing matters but the image. If the image is compelling and the market wants to pay for it, then it doesn't matter how the image was taken. Another part of me feels like taking identical photographs alongside other photographers is cheating, especially when you are given 60 seconds to shoot. But, what if we had hired a guide and we were the only ones in the canyon? Would that make the photograph any more original or valuable? Unless you discover the location, it's very difficult to produce a totally unique landscape photo. Obviously, this "lesson" didn't make it into "Photographing the World 4," because there really wasn't anything to teach, and there really wasn't anywhere to film either. But it was such a unique experience that we thought it should make the BTS series. After this failure, I'm happy to say that we were able to knock out a great lesson at Monument Valley. 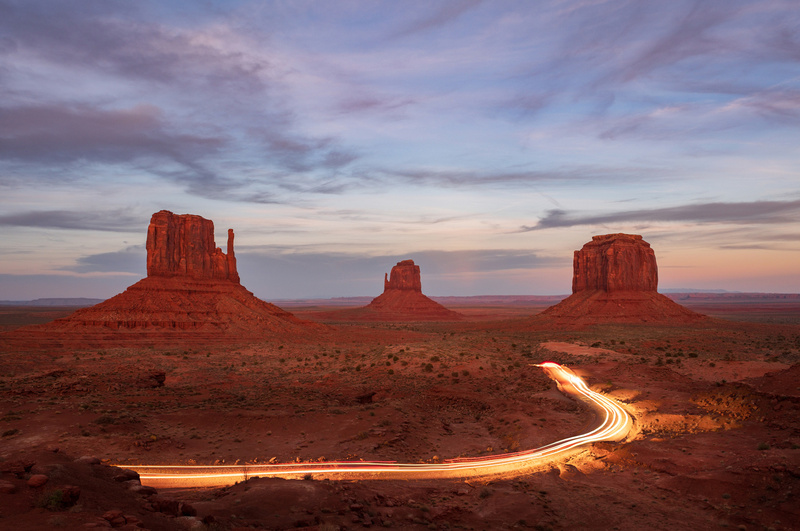 Elia shot through sunset and was able to blend car trails at night into a dusk shot of the landscape. To learn more about "Photographing The World 4," check out the Fstoppers Store and stay tuned for the next episode that will launch next week. I did that Antelope Canyon experience a few years ago...ridiculous, isn't it!? I think people expect something quite different. I understand everyone wanting access. But it's obviously become way too much of an income source at this point. Sad to see such a beautiful place so heavily walked. I hope it lasts.. Noted Nature photographer Bill Ratcliffe, of Orem, Utah and all those Audubon magazine covers and photo spreads was photographing Antelope Canyon in the 1950's. No crowds, hand carry wooden ladders with a Navajo friend who could take him through. Could set up his 5x7 Burke & James with 4x5 back, use his only lens - a 10 inch Commercial Ektar, shoot Ektachrome film and then go home and process the film by hand in the basement after dark. Bill Ratcliffe was excellent and did major work in Southern Utah and especially Death Valley, CA for decades. Might check out Josef Muench as he basically "made" Arizona Highways magazine and photographed in the slot canyons - and then his son David Muench did as well. David is probably the finest nature photographer the US has ever seen. Excellent photographer and a good person all the way around. Those early photographers saw the canyons long before the tourist groups and time limits we see now were imposed. Fine images from fine photographers. Most of them original compositions as they had not seen the masses of images now on the market. Even with the tours, take the time to visit the area. It is worth it. I was in Page three years ago and faced the decision to visit Antelope Canyon. I decided against it. I do not like rip-offs, and there's nothing left to do with landscape photography. Too bad that such a nice spot earth is being commercialized. Unfortunately, this is a development that can be observed everywhere. Iceland was a real insider tip in the past. Meanwhile, this beautiful country is being overrun by tourists. You have to focus more on unknown places and think about sharing the views in social networks at all. Why photograph a cliche? Because it is easy? This planet is huge with endless possibilities. Because Elia is photographing the world and this includes well-known locations. By releasing BTS videos like that people who want to photograph those well-known places can be better prepared for the actual experience at the location. And from what I see in those BTS, photographing the cliche at that canyon is not easy at all (from customer/tourist standpoint). It's a difficult thing producing a tutorial like this because our main goal is to come away with usable lessons. If we spent a week scouting areas that have never been photographed, especially in expensive places to stay, there is a great chance we would come away with nothing memorable while blowing tens of thousands of dollars. The location in Italy you mention is exactly that. Very few people had photographed Pietrapertosa and we thought it was worth wasting 5 days there to capture an image few had taken (Elia even went back to get a better version altogether). I agree, there are tons of cool places to shoot and discover but our goal is mainly to teach the theory of scouting, composition, and post processing so everyone can apply those techniques regardless of where they are located or visiting. If we had unlimited time, budget, and portable storage, I would love to do a tutorial that featured unique never before photographed locations but logistically that isn't very easy to pull off. I understand, it's tricky. I think what you could try is to use local scouters you trust, building a plan beforehand and talking it over with Elia. 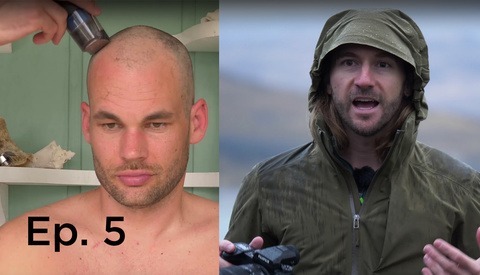 You have many people in your fstoppers crew that live outside the US. For example you could very well use Ryan Cooper from Canada to scout locations there, or Mads Peter Iversen from Denmark. If I were to advise you on locations for France for example, there's insane yet accessible places well outside the tourist trail. You could shoot the larch trees in the Queyras mountains in autumn (it's a pine tree which needles turn orange and fall), or visit Saint Véran there, an authentic village with traditional chalets. In Ecrins national park, there's picturesque alpine lakes, like Lac Noir & Lac Lérié. You could visit the Côte Vermeille, which is like the riviera only better. You could visit the villages of Occitanie like Saint Cirq Lapopie, or Collonges la Rouge. There's the insane coastline of Brittany, with spots like Cap Fréhel or Presqu'île de Crozon. And finally there's amazing gorges, not just the famous turquoise Gorges du Verdon but also Gorges du Tarn or Gorges de l'Ardèche. Logistically, France is easy, plenty of places to stay at and great roads. Another place I've been to many times and would be so easy to use for a tutorial is Tasmania. Google places like Cape Raoul and Cape Hauy, insane ocean cliffs. Places like Cradle Mountain, Bay of Fires (orange lichen covered rocks), Freycinet (Wineglass bay is probably the most known spot), Bruny Island, Mount Field (alpine lakes and giant trees that can grow taller than sequoias), Rocky Cape, Strahan... It's like New Zealand, but with less tourists, and Tasmanian devils. As Patrick said the tutorials are aimed for teaching photography, not an overall tour guide. There are many travel vlogs and blogs for that purpose where we can enjoy the beauty of the vast amount of spectacular locations, but most of them won't tell you how they shot it. 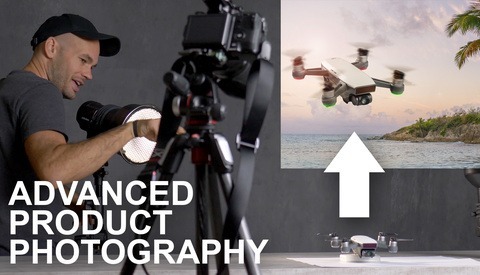 The knowledge in this tutorials covers all the bases one needs to create 95% of the existing travel photographs today. Nick, I totally feel ya man. I would love to include locations like this as well but unfortunately I'm only 1 vote in a group of people producing these. I'd love to see places few people get to visit verses going to all the hot spots everyone has been to before. The inevitable consequence of trophy photography, with no individuality !! The same is happening in Iceland, and the Lofoton islands in Norway. Hey John, I logged in just to reply. I love that term "trophy photography" I'm going to use that. BTW, going there looks awful. Not worth it IMO. Been there twice and never again. It's a cash cow for the locals and sadly it kills the experience. Unfortunately the same can be said about every famous landmark in the world. Grand Canyon which I love with all my heart is an absolute circus. My world favorite Machu Picchu is getting beyond absurd....this is unfortunately the sad reality we live in. Even some of the most remote locations like the Himalayas and Karakorum are slowly being subjected to this insanity. Mick Ryan really a negative vote, not that I care, but what's your motivation? If you disagree please explain. Too many people on the planet. Finding a place to be alone in beauty is hard. I'm glad I never did Antelope. I went once to Arizona/Utah, and visited only national parks and state parks. A few areas were too crowded though, the worst was Zion. If you're in Zion, do Observation Point as a hike, not Angels Landing. I hear that Arches is suffocating now. Back in May 2015 when I did it it was ok. But it was stormy weather in the middle of the week so that may explain it, same in the Island in the Sky section of Canyonlands (that includes the overestimated Mesa Arch). I'll go back one day and explore more secluded locations, national monuments like Grand Staircase-Escalante. But there's no point in visiting Antelope other than saying to other people "I did it". I live in N. AZ. and love to shoot landscapes, but have no desire to do all that for a pic that has been taken millions of times. After seeing this video, I now have lost that little twinge of desire I did have to go. 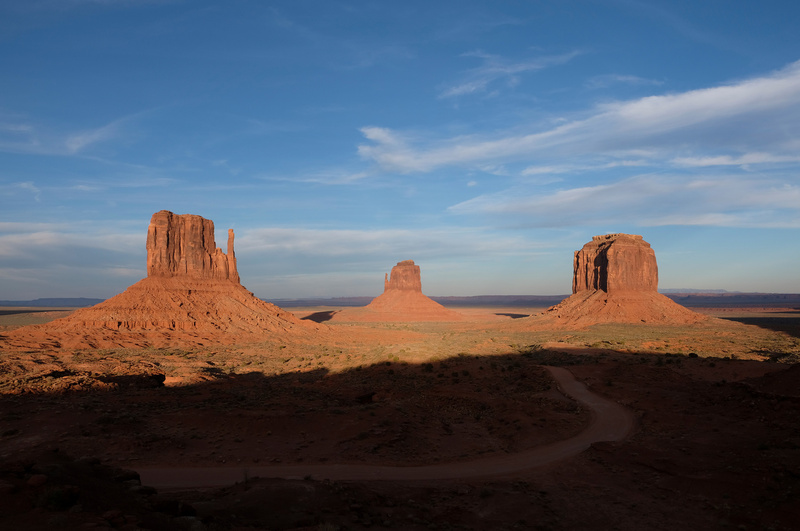 Monument valley is nice, but you need to pay for the back roads tour to get to some less photographed angles. I wanted to go to antelope canyon but decided that if i go i would not shoot. i sometimes dont shoot but take in the experience. I find that u dont get the same experience behind a camera than actually looking but with so many people i dont think having any experience is possible. I would love to see elia shoot not so iconic places. Many people like myself will probably never get to see these and the challenge is to make great images at less impressive places. The "photography tour" used to be really great on the lower canyon. I did back in 2014 and they would let you go down with the main tour and then go back by yourself for 1 hour. Which was perfect, because it gave you many chances to be completely alone down there. The next time I went I found out they stopped that because people were abusing it by doing things that were damaging the walls and showing a general lack of respect. Which is too bad, but I can't say I blame them. There are ways to make shooting these slot canyons more enjoyable if you do a little homework. For instance, visiting Upper or Lower Antelope Canyon during other times of the year or even other times of the day. Yes, you'll miss the sunbeam shots but you may enjoy the canyons more. Another suggestion is to search out some of the other canyons. Certain guides have access to other canyons, sometimes exclusive access. I visited these canyons about a year and a half ago. We got access to canyon where it was just myself, my partner and our guide. That was a really great experience. I'm still glad we went through Upper Antelope though (it was part of our package). Owl and rattlesnake canyons are nicer in my opinion. Much more open, more light and obviously far less crowded. They really need to stop bus tours to these kind of places. Leave them for just the people that appreciate them enough to make the hike. Easy to say but if you owned it personally you'd probably do the same thing. I know I would. besides, while everyone is at antelope...every other slot is empty ready for a great experience. Learn some basic canyoneering techniques and southern Utah/North AZ has untold canyons like this. - ok starting now we’re only letting people in that really appreciate the place. The crowd slowly starts to fade until only a few people left. And then those people will still need to pass the test on the appreciatanationator. That's right. Keep all the riffraff out. Can't make the hike? Screw you. I don't care if you're a cripple. Haven't got the latest camera gear? You're out, because obviously you're not serious. Wait, you're under 16? Obviously you're not old enough to appreciate it. You're not me? How dare you even think you're good enough?! I totally agree. What makes any of us more SPECIAL than anyone else. If we are taking a photo home to show anyone aside from just keeping it for our own memories we are plainly just as guilty as the next guy. Take care of these things... But dang... you only have so long on this earth. Go see as much of it as you can and don't fault anyone else for wanting to do the same. 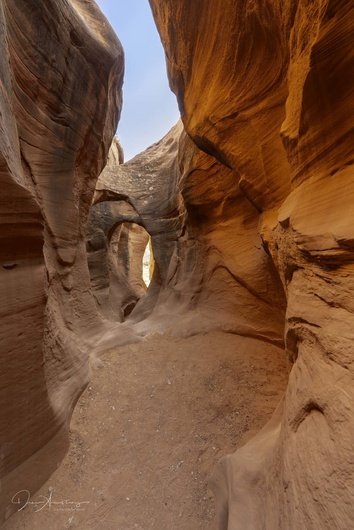 (By the way, there are a TON of other very empty slot canyons in Utah and Arizona on public lands... just do some homework.) Antelope is epic... and I will for sure go again and again... and I am for sure going to go when it is less busy but I expect people will be there and good for them. I did this one in August. Saw three other people all day long.